The Capers survive a slow start and Nina Davenport’s prowess, earning a 48-36 win. CAPE ELIZABETH — Simple and easy are two very different concepts. Cape Elizabeth’s plan Monday night was simple: Stop Nina Davenport and let Freeport’s other players try to beat the Capers. Simple? Yes. Was it easy? Let’s just say it was simple. Emma O’Rourke of Cape Elizabeth gets trapped in the corner by Freeport’s Jessica Wall, left, and Nina Davenport. O’Rourke made 5 of 6 free throws in the fourth quarter to help the Capers secure their victory. Kate Breed of Cape Elizabeth drives for shot against two Freeport defenders. The Capers evened their record at 2-2 after losing their first two games of the season. Hannah Sawyer scored 16 points, had nine rebounds and blocked three shots to help Cape Elizabeth rally Monday night to a 48-36 victory over Freeport in a Western Maine Conference girls’ basketball game. After trailing early, then nipping at the Falcons’ heels, Cape took its first lead, 19-18, when Maddison Lengyel scored the final basket of the first half. Cape went on an 11-0 run midway through the third quarter to pull away for good. Sawyer and Maddie Bowe each scored four points to key the run for Cape Elizabeth (2-2), which has won two straight after opening 0-2. Bowe, who finished with 12 points off the bench, also pulled down four offensive rebounds in the second quarter. 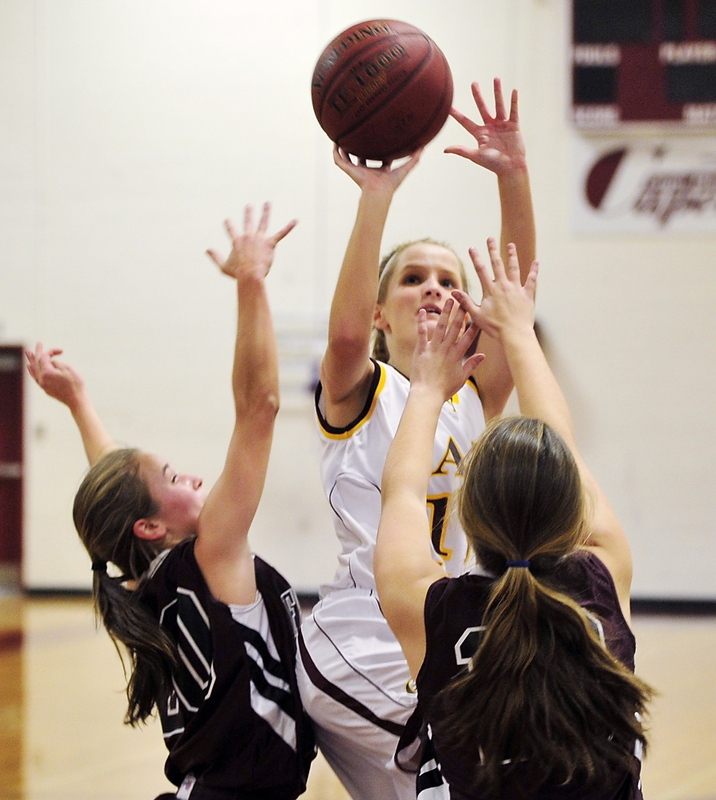 Emma O’Rourke (eight points) went 5 for 6 from the free-throw line late to help seal the victory. “We had a defensive plan coming in, and we executed it pretty well,” Cape Elizabeth Coach Christine Casterella said. “Davenport still had 21 points, she’s that good. The plan was to limit her touches, make her work for her points and make the other kids beat us. Davenport added nine rebounds and had four steals, all while contending with pressure, chiefly from guard Mary Perkins and forward Ashley Tinsman. But the Capers did prevent the other Falcons from filling the void. The Falcons (1-3) held command early, holding Cape without a field goal until 3:47 remained in the first quarter. Meanwhile, Freeport will turn its focus to fundamentals.